Volvo special tools "may" be required for installing the ball joint on S60 models. Special tools are special order and call for price. Note! The illustrations in this service information are used for different model years and/or models. Some variation may occur. However, the essential information in the illustrations is always correct. Note! Replace on both sides. Remove the nut on the control arm. Use a Torx wrench as a counterhold. Align puller 999 7062 with the link arm and nut 999 7231 . Tighten the puller 999 7062 so that the ball joint releases from the link arm. Caution! Do not pull the drive shaft as the axial pinions cannot support large loads. Note! 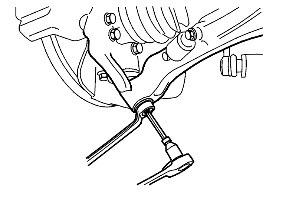 If the hook is positioned at point (2) there is a risk of damaging the rubber boot on the ball joint. Press the control arm down using lever 999 7076 . Position the hook at (1). Release the spring strut from the control arm. Remove the 2 x screws for the ball joint. the sledgehammer: 999 2709 on the nut. Use nut 999 7230 and impact hammer 999 2709 . Tap off the ball joint. Warning! Always use protective goggles. Clean the mating surfaces for the ball joint and seat. Use a rotating wire brush. Lubricate the seat with wheel bearing grease, part number 1161689 (75 ml). Note! For tightening torques, see: Tightening torque . The guide screws: 999 5781 have a wrench grip (see arrow) which is asymmetrically positioned. Use the screw (1) with the greater distance from the wrench grip. Use the screw (2) with the shortest distance from the wrench grip. Caution! 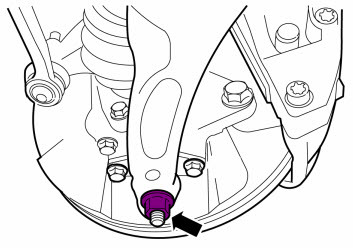 Leave the protective cap for the ball joint in position to prevent damaging the rubber boot. Loosely install the new ball joint using the guide screws. Caution! Take care not to damage the ball joint boot. Temporarily remove the protective cap from the ball joint. Loosely install the new ball joint using the press tool 999 5781 . Press the ball joint up towards the seat. Use press tool 999 5796 . Check that the ball joint is centered in the seat. Knock in the ball joint. Use a copper mallet. Tighten the ball joint. Use 2 x new screws. Tighten. See: Tightening torque . Align the spring strut in the control arm. Note! Use 999 5500 as a torque wrench. Note! A counterhold is not required when angle tightening if the joint has been tightened to 50 Nm. The friction between the ball joint and control arm is greater than between the nut and threads on the ball joint. Install the 1 x nut. Tighten according to step 1. See Tightening torque:Summary of tightening torques for specific components . Use bevel protractor: 951 2050 . Angle-tighten according to step 2. See Tightening torque:Summary of tightening torques for specific components . Rust protect the thread outside the nut. Use socket 999 5467 as adapter for the torque wrench or a cap wrench adapter that is deigned for torque wrench. Install the new nut and tighten acc. to Tightening torque .